This post is sponsored by Ocean Mist Farms. As always, all opinions are my own. Thank you for supporting the brands that keep Lively Table running! After patiently waiting for winter to FINALLY end, I think it’s beginning to look like spring. One of my favorite signals of spring? Artichokes! The gorgeous green flowers are so iconic in spring dishes. Artichokes are traditionally a little bit of a pain (sometimes laterally – you have to be careful with the poky outside leaves!) because they take a while to clean and cook. But the tender centers are oh, so worth all of the effort. 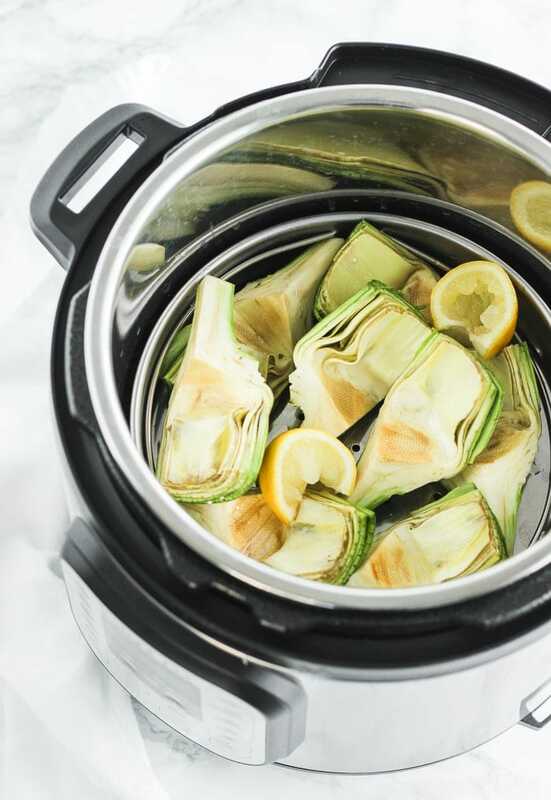 And now, artichokes are faster and easier to cook in the Instant Pot! Finally, a way to make cooking these beauties easier! 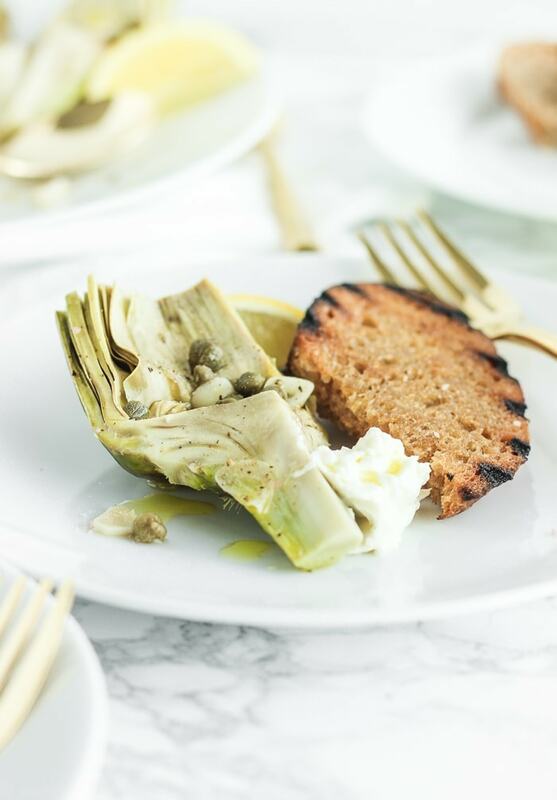 With a little help from pressure cooking, these Instant Pot artichokes with white wine, capers and burrata cook entirely in in the Instant Pot and come together in about 30 minutes from start to finish. That includes cooking the delicious white wine caper sauce, and it’s less than half the time of traditional cooking methods! 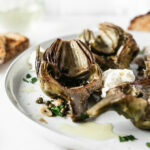 Instant Pot artichokes with white wine, capers and burrata is a gorgeous appetizer of tender, delicious artichokes with a savory white wine, garlic and caper sauce and creamy burrata. I love them served with freshly baked sourdough toast, but the dish also makes a delicious vegetarian main dish on top of your favorite pasta. All served with a crisp white wine, your table will feel more like spring in no time. Have a large bowl of ice water with sliced lemons handy to place your cut artichokes in. This will help prevent oxidations and subsequent browning. 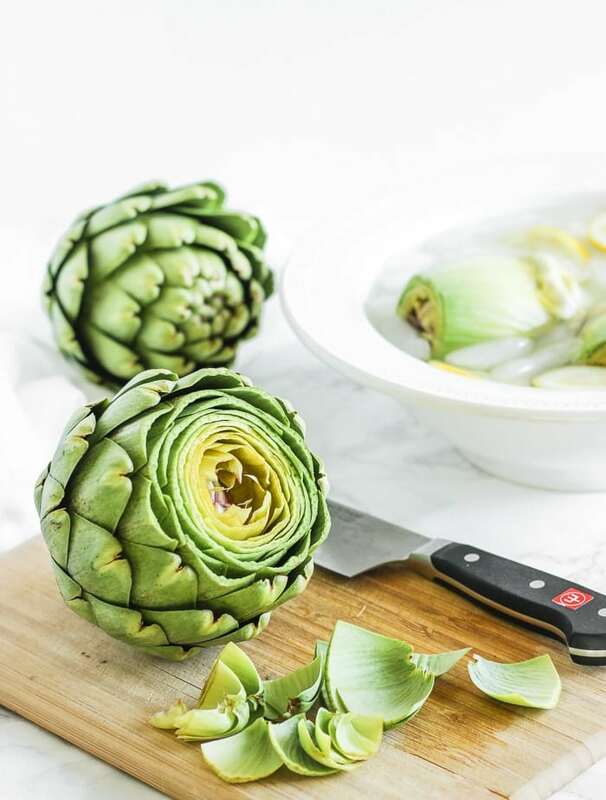 Use a large, sharp knife to trim off the top third of the artichoke, then pull off most of the outside leaves. You can use gloves to do this if you wish. For the insides (after cutting into fourths), use a small paring knife to cut right under the fuzzy choke, then gently pull on the innermost sharp leaves to remove the leaves and fuzzy parts. 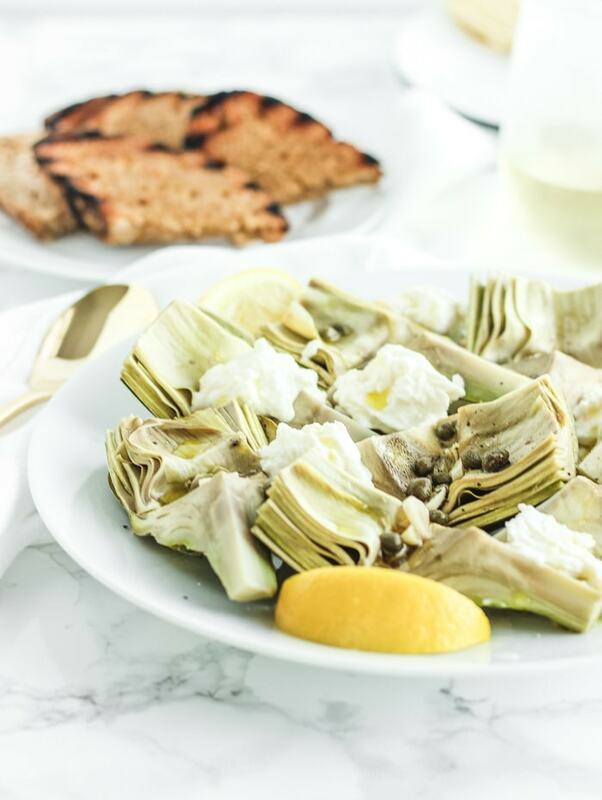 After just a few minutes in the Instant Pot, these simple but delicious Instant Pot artichokes with white wine, capers and burrata are ready to serve for the perfect spring meal that will impress all of your guests! No Instant Pot? No problem! 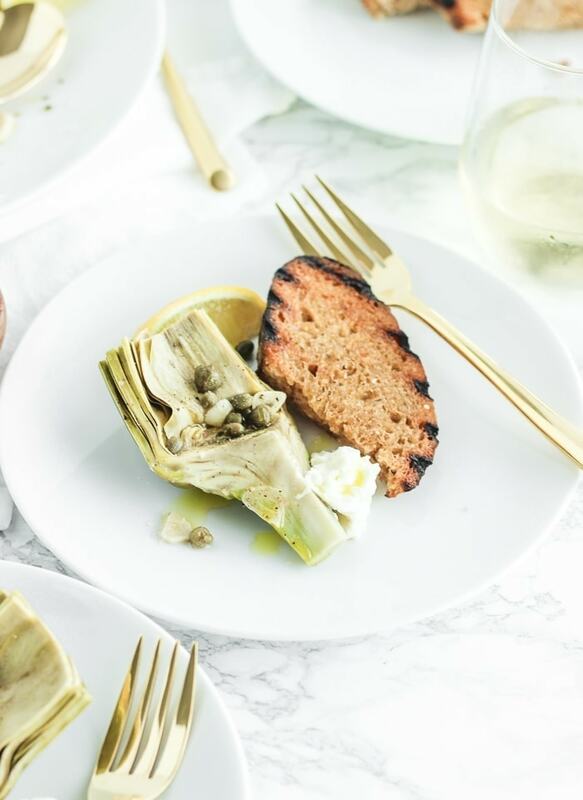 Enter to win an Instant Pot, Ocean Mist Farms premium artichokes, and artichoke swag HERE! Close the lid and make sure the steam vent is set to “Sealing”. Press “Manual” then press “Pressure” until the Instant Pot is set to “High Pressure.” Adjust the +/- buttons to set the timer to 10 minutes. Cook. Once timer goes off, carefully turn the vent to “Venting” (away from your hands and face) to release pressure until valve has dropped. Open the lid and carefully remove steamer basket and trivet with a pair of tongs. Press “Sautee” until Instant Pot is set to “Normal.” Use +/- buttons to set the timer for 10 minutes. Cook wine down for 8-10 minutes or until slightly reduced. Press “Cancel” to turn off Instant Pot. Oh this sounds delicious! I recently got an Instant Pot and have been looking for recipes to try – can’t wait to give this one a go! Thank you Whitney! You’ll love this! Can’t wait to try this. Sounds delicious! 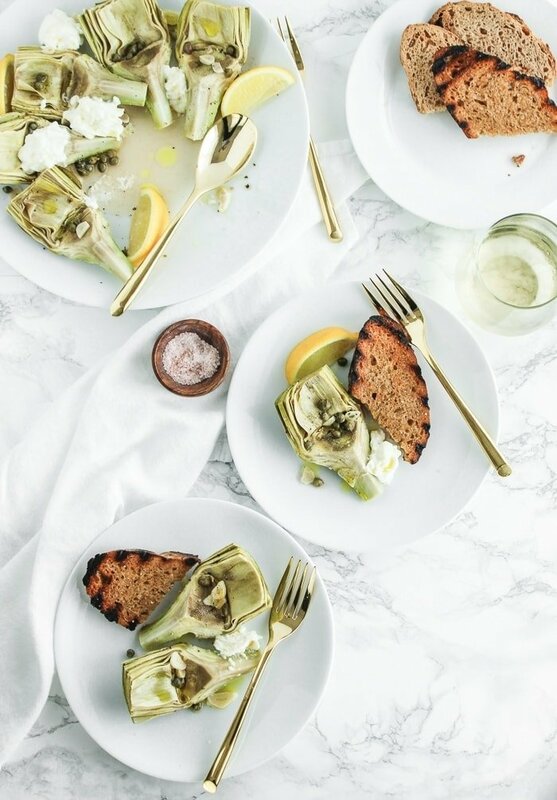 Please keep artichoke recipes coming!